Pretty much the only reason I would ever have considered requesting a rural placement over an urban placement in Japan is the heightened likelihood of personal contact with Japanese people. Those who live in the paddocks of Hokkaido, with mountains for highrises and lakes for onsen are LONELY - they will take anyone into their houses in return for food and company, and I'm assuming that that would include red-haired, hook-nosed tattooed foreigners with a Kiwi twang and a taste for red wine. JETs tell tales of being literally dragged off country roads and into the living rooms of old ladies, where they are plied liberally with food and presents and alcohol and made subject to lengthy reminiscing about the German tourist she saw across the street 20 years ago. I don't want the paddocks - I'm from NZ, I've seen enough livestock to last a lifetime - and you can keep the creeping loneliness that eventually turns all such JETs into raving countrified loons - but I WANT an old lady to pat me on the head and bake me cookies and sew me a kimono from scratch. I miss my Mum. I don't have an oven. I've never worn a kimono. In Sapporo, one is far more likely to be enticed into an establishment by a host boy with hair to the sky and tight tight pants, where the cookies cost $50 dollars apiece and you're also far more likely to removing kimono than donning them. I'm not saying there's no one here who will pat my head, but it'll cost my whole pay cheque and they won't stop at my head. Ok, he's a man. But he is both little and old and - bonus - utterly mad. Imposing. The eggplant, despite our fears, was pickled and moist and delicious. We polished it off, whereby it was followed with a small bowl of noodles and fresh fish. We decided at this point that he was treating us to a tapas style selection of the specialties of his restaurant, and settled into an evening of delicious nibbles. However, at this point he either ran out of food or imagination, because the next thing placed in front of me was a box of chocolates. And then a bag of biscuits. I can only assume that he panicked at the rate at which we were devouring his food and ducked out back to fish around in his own pantry for anything he hadn't yet opened. Either that or he sprinted across the road to the supermarket and grabbed the first thing he saw. I was three beers in by this stage,and was quite amenable to his menu. I decided that this man was a mind-reader (even MORE impressive when you consider that the mind he read was thinking in a different language) - I love chocolate and candy and biscuits, and only don't eat them for dinner regularly because Mummy told me not to. So I tucked in. I believe that the relish with which I took to his food weakened his defences, because from that stage onwards he became loving and doting and fatherly, in a drunkenly charming way. 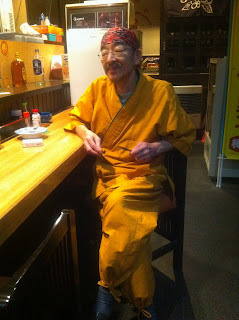 We began a long conversation, my half in English, his in Japanese, each utterly imcomprehensible to the other. I introduced myself as Scarlett - he introduced himself as Crazy Takashi (Note to self: must get descriptive nickname). It is indicative of the character of this man that the only word he knew in English was "crazy". However, our conversation was short-lived, because as soon as I introduced him to Aravin, he forgot all about me. Aravin became the son he never had. He doted. He worshipped. He poured him a glass of spirit the size of a generous latte, and they liberally traded cigarettes and English words. Takashi described Aravin as strong; Aravin obligingly flexed his bicep. Aravin played Takashi the haka on my iPhone; Crazy Takahashi responded by serenading him with Simon and Garfunkel. I sat in the corner and ate all the biscuits. Have I mentioned that we were the only people in the restaurant? Well, we were. Crazy Takahashi. The first Japanese person to take us into his home (um, restaurant), ply us with food and laden us with gifts. 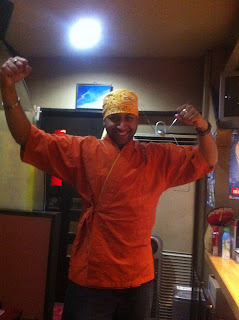 By the time we left, Aravin had accumulated one whole chef's uniform, one apron, six bandanas (I kid you not) and a friend for life. I ad eaten many, many biscuits. I think of him fondly now, still afflicted by the hangover that the combination of rice wine, plum wine, beer, eggplant and biscuits for dinner will give you, crooning away to Simon and Garfunkel... And while it may not be strictly traditional to dine on chocolate-covered macadamia nuts, I still feel like I got the full, extremely foreign, Japanese experience.